Connection too slow? Click Here! Need to contact a Diocesan Council or Metropolitan Council member from the Diocese of Alaska? 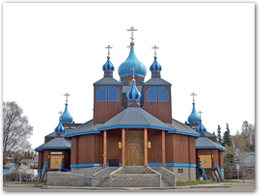 What follows is a homily given by St. Patriarch Tikhon of Moscow in 1901, while he was Bishop of Alaska and the Aleutian Islands. In it he calls us to be mindful of our own sins, instead of those of others. Let it remind us that as we begin this Holy Lenten Season, his words are as true today as they were in 1901. May your Lenten Journey be fruitful and guide you to a new level of joy in the Lord. Yet it is said to be extremely difficult to forgive discourtesy and to forget disrespect. Perhaps our selfish nature finds it truly difficult to forgive disrespect, even though in the words of the Holy Fathers it is easier to forgive than to seek revenge. (St. Tikhon of Zadonsk after St. John Chrysostom) Yet everything in us that is good is not accomplished easily, but with difficulty, compulsion and effort. "The Kingdom of Heaven suffereth violence, and the violent take it by force."(Matt. 11. 12) For this reason we should not be discouraged at the difficulty of this pious act, but should rather seek the means to its fulfillment. The Holy Church offers many means towards this end, and of them we will dwell on the one which most corresponds to the forthcoming season of repentance. Unfortunately, brethren, we do not like to acknowledge our transgressions. It would seem natural and easy for a person to know his own self, his own soul and his shortcomings. This, however, is actually not so. We are ready to attend to anything but a deeper understanding of ourselves, an investigation of our sins. We examine various things with curiosity, we attentively study friends and strangers, but when faced with solitude without extraneous preoccupation even for a short while, we immediately become bored and attempt to seek amusement. For example, do we spend much time examining our own conscience even before confession? Perhaps a few minutes, and once a year at that. Casting a cursory glance at our soul, correcting some of its more glaring faults, we immediately cover it over with the veil of oblivion until next year, until our next uncomfortable exercise in boredom. Yet we love to observe the sins of others. Not considering the beam in our own eye, we take notice of the mote in our brother’s eye. (Matt. 7. 3) Speaking idly to our neighbor’s detriment, mocking and criticizing him are not even often considered sins but rather an innocent and amusing pastime. As if our own sins were so few! As if we had been appointed to judge others! "There is one Lawgiver, who is able to save and to destroy" – God. (James 4. 12) "Who art thou to judge another’s servant? It is before his own master that he stands or falls." (Rom. 14. 4) "Thou hast no excuse, O man, whoever thou art who judgest. For wherein thou judgest another, thou dost condemn thyself. For thou who judgest dost the same things thyself." (Rom. 2. 1) "Examine yourselves, whether you are in the faith; put yourselves to the test." (2 Cor. 13. 5) The pious ascetics provide a good example of this. They turned their minds to themselves, meditated on their own sins and avoided judging their neighbors at all costs. One pious starets, noticing that his brother had committed a sin, sighed and said, "Woe is me! As he sinned today, so will I tomorrow." And the following is a story about another ascetic, Abba Moisei. A monk committed a sin. The brethren, who had assembled to decide his case, sent for Abba Moisei, but the humble starets refused to attend the council. When the rector sent for him a second time, he appeared, but in quite a striking manner. He had taken an old basket, filled it with sand and was carrying it on his back. "What does this mean?" asked the monks, catching sight of him. "See how many sins I bear behind me?" answered Moisei, pointing to the heap of sand. "I don’t see them, yet I have come to pass judgment upon another." So therefore, brethren, following the example of the ascetics, upon observing others’ sins, we should consider our own sins, regard our own transgressions and not judge our brother. And should we hold anything against him, let us pardon and forgive him, that our merciful Lord may forgive us also.